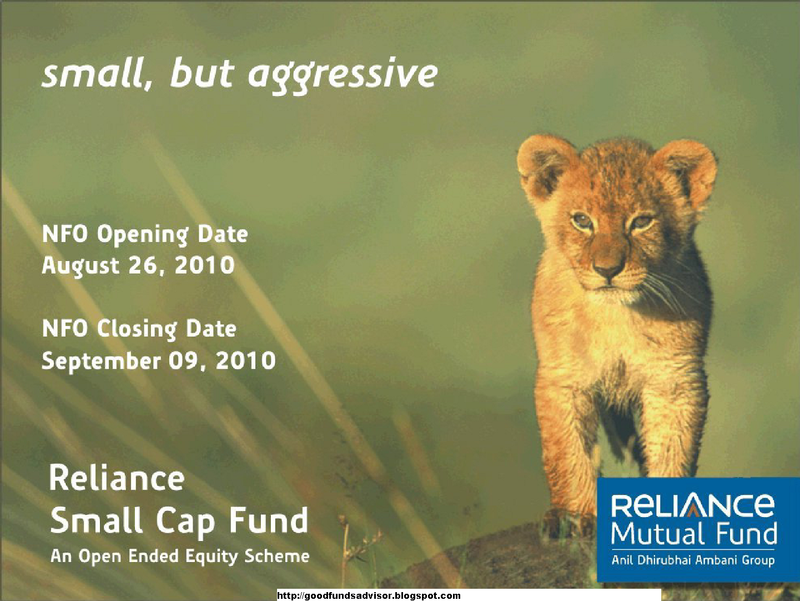 Reliance Mutual Fund have launched an aggressive fund focussing purely on Small Caps aptly named "Reliance Small Cap Fund". 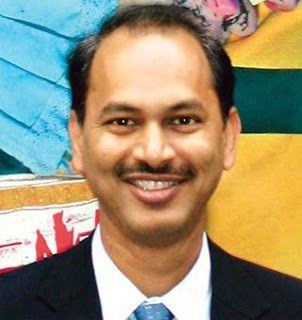 The Fund will be managed by Mr.Sunil Singhania who has had a great success with Reliance Growth Fund. Small Caps are largely under-researched and the key is to identify companies which can become Large Caps. Reliance Small Cap Fund will be investing in companies which have a market cap between Rs.170cr to Rs.2200cr. The Fund will aim to invest in Entry Level Companies which however have a good quality Business Model and has the ability to scale up itself to become Large Cap. The notable thing is that unlike with their NFOs, this time Reliance have had a low key exposure of this Reliance Small Cap Fund in terms of ads, hoardings. Mr.Shailesh Raj Bhan, Fund Manager of Reliance equity Opportunities Fund said, the low profile was intentional and they were looking at a size of around 500 crore for this fund. Mr.Shailesh Raj Bhan also indicated they would be looking at a portfolio of around 50-60 companies. The Fund would be doing following up a purely "Bottom Up" Approach and would be less likely to look at Macro View foccussing more on micro view. Small Caps are very volatile., they tend to rise more than the rest of market in a bull market and likewise fall steeper than the rest in the Bear Market. Timing your entry and exit from these small caps is imperative and essential to make maximum profit. DSPBR Micro Cap Fund has done exceedingly well but most probably its close ended nature helped the fund hide the fact of the volatility it had to face. 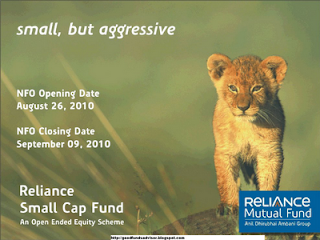 Sister Reliance Regular Savings Fund-Equity has about 18% exposure to Small Caps and has done exceedingly well even in Bear Market of 2008. The most notable thing about Small Caps is this, The BSE Small Cap fund has outperformed the Sensex and BSE Mid Cap by a wide margin of more than a huge huge 20% over a 6 year period. That sums up the issue. Yes, Small caps are volatile but they have the potential to become the next multi-baggers if you spot the right one. Who better than the Reliance Star Fund Manager, Mr.Sunil Singhania to do this for you?? Although, Small Caps tend to be very volatile, they can give your portfolio a much needed 'alpha' adding to the overall returns. The volatility associated with small caps tend to get evened out over a period of time. SIP Investment would be the BEST method to maximize your returns from this Fund. DEFINITELY RECOMMENDED FOR THOSE WHO CAN DIGEST HIGH VOLATILITY. RECOMMEND INVESTMENT THROUGH SIPS AND/OR INVESTING A SMALL SUM AT REGULAR INTERVALS. Caveat : Have a minimum of 3 years time frame and Do not have more than 10% exposure to this Fund, even if you are an Aggressive Investor. Note: Exit load is quite at 2% for redemption before one year., which however, is actually, is beneficial and motivates to stay invested for longer period. Mutual Funds there is a vast array of choice of different investment strategies and types of fund. No matter how much you want to invest, what goals you have, or the amount of risk you can accept there is a mutual fund that is right for you. Nice information. Thanks for the author and admin for providing such nice information. It is really helpful for the blog readers. please keep updating daily for us. I also want to share something for those who are looking for investments. EMI for your home loans could go up. if you dont want to pay a higher EMI, your loan tenure would get longer. A high EMI would also decreases your loan eligibilty. you could be paying more interest on your car or bike loans. you may also have to pay a higher price for buying your vehicle as automobile comapnies would pass on higher ineterest rates for nifty chart people who save money would get higher interest income once banks increase their deposit rates. senior citizens could benefit the most asthey get higher rates.